As a full-service facility solutions provider leading the industry in meeting the unique needs and challenges of today’s building managers, and owners, Complete Commercial Solutions provides expert care for your facility. Our partnerships include a commitment to quality and integrity throughout the continuum of service. 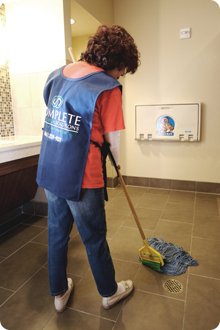 Complete Commercial Solutions was founded with a mission to set a new standard of quality in service: To foster an atmosphere of caring staff focused on delivering excellence in customer service. Accountability and accessibility to our customers and each other is our standard of measurement. It is our duty to make sure that our customers not only receive the best service and value possible, but that they receive it in a way that lets them know they’re respected and cared for. Complete Commercial Solutions knows that the key to smooth-running operations is support, supervision, and excellent communication. Our team is available whenever you need us to coordinate with your staff for training, special events, etc.